Posted on 13, October 2016 by EuropaWire PR Editors | This entry was posted in Art & Culture, Education, Society, United Kingdom and tagged Bill Friar, Bryan Organ, Chris Shaw, Peter Soulsby, Professor Paul Boyle, Sir David Attenborough, University of Leicester. Bookmark the permalink. LEICESTER, 13-Oct-2016 — /EuropaWire/ — A stunning new portrait of University of Leicester honorary graduate and Distinguished Honorary Fellow Sir David Attenborough at Leicester’s New Walk Museum has been revealed by the man himself. The painting was commissioned to commemorate Sir David’s 90th birthday, and was produced from a series of private sittings earlier this year between Sir David and the distinguished portrait artist Bryan Organ – who is also an honorary graduate of the University. Sir David revealed the portrait at New Walk Museum and Art Gallery last month at an event attended by President and Vice-Chancellor Professor Paul Boyle and Director of Development and Alumni Relations Bill Friar. 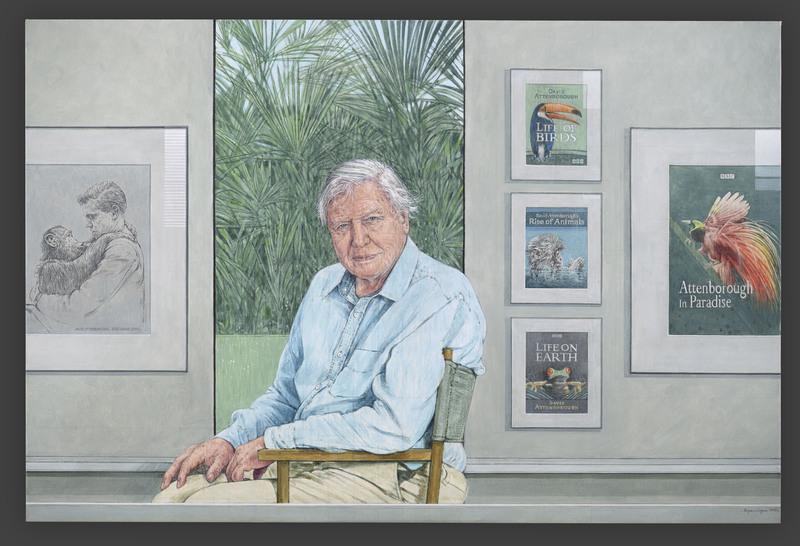 The work, which is believed to be the only solo portrait for which Sir David has agreed to sit, is an acknowledgement of his childhood connections to New Walk Museum. As a teenager, Sir David was a volunteer at the museum, and along with his brother Richard, the late Lord Attenborough, grew up in College House in the University of Leicester when their father Frederick was principal there. Lord Attenborough went on to international fame as an actor and director, while Sir David became one of the world’s best renowned naturalists and broadcasters in a career spanning more than 60 years. The new portrait will complement an existing portrait of Lord Attenborough, also painted by Bryan Organ in 1986, which hangs in New Walk Museum. Lord Attenborough was also a honorary graduate and Distinguished Honorary Fellow of the University and Patron of the Attenborough Arts Centre. Organ’s other acclaimed works include portraits of Prince Charles, former Prime Minister Harold Macmillan and 2003 Rugby World Cup winning England captain Martin Johnson. Leicester City Mayor Peter Soulsby said: “Sir David has connections with the city going back to his childhood, and New Walk Museum was key in forming his early fascination with the natural world. “It is an enormous honour for the city for him to come to the museum to unveil this wonderful new portrait, which is a very fitting way to celebrate both his 90th birthday and his history with Leicester. “The museum is of course already home both to one of the world’s largest collections of Picasso ceramics, bequeathed to the city by Sir David’s late brother Lord Attenborough, and Bryan Organ’s breath-taking 1986 portrait. “Sir David’s portrait will now have pride of place as a permanent exhibit alongside Lord Attenborough’s portrait. The portrait was commissioned by the City of Leicester Museums Trust (COLMT) charity, on behalf of the city council’s museums and represents a ‘people’s portrait’. COLMT is a charity founded in 1930, which buys items of historic, scientific and artistic interest for the city’s museum collection, using funds raised through money placed in donation boxes across the city’s five museum sites, as well as other donations. COLMT chairman Jim Roberts, of the School of Museum Studies, added: “In the past, we have reacted to offers of items for purchase, using the money donated by museum visitors, but to be able to actually commission a new work of art was an exciting prospect. “It was remarkable to have the opportunity to discuss the process of creating a portrait with the artist and to watch the painting develop. I am grateful to Bryan Organ for involving us in the process from start to finish – a rare privilege! The portrait was unveiled at a private event at New Walk Museum’s Victorian Gallery. Earlier in the day, Sir David opened a new visitor centre at Bradgate Park.